A 6 year old video that’s 1 hour 22 minutes, and I don’t know how I’ve missed it until now. It is a remarkably well done survey of the science, the costs, and the foolishness; all presented in a wonderfully biting way. The political / costs aspects are focused on Australia / New Zealand as he’s from Down Under. This entry was posted in AGW Climate Perspective, AGW Science and Background, Global Cooling, Global Warming General, Political Current Events and tagged science, taxes, Video, Warming. Bookmark the permalink. It’s sad that Bob Carter died suddenly. Great video – straight forward and no frills. Too bad there are so few like him to give a good counter point to the global warming propaganda. That is the first chart that I have seen with time periods attached to the onset and termination of the Younger Dryas 3 year onset and about 60 years for return to the normal trend line. I was surprised however that the plot showed the younger dryas temperature anomaly began with a sharp warming spike not a sudden cooling. I was not aware of that. I was under the impression that the warming had proceeded for some significant period of time and then cooled sharply. dropping back to glacial temperatures. That temperature pattern does not fit any of the scenarios I have ever seen discussed for the Younger dryas. An asteroid impact on the ice sheet in the northern hemisphere (Canada) would have caused a sharp cooling from then normal temperatures in the northern hemisphere not a sharp spike in temps followed by a several century drop back to glacial temperatures. Time to go back and re-examine the hypothesis. I am referring to the item labeled as (1) in this graph which Bob Carter said happened in only 3 years but which was localized to the northern hemisphere, there was not a comparable sharp increase in antarctic temps, they increases in a long term ramping up of temperature over this period not a sudden sharp warming. It has been my experience that as soon as you show the weakness of the science the argument becomes the necessity for western culture to behave better.IOWs be “earth friendly”, that all the improvements to the ecology mean nothing because at some point a group did something bad. Larry, wouldn’t a catastrophic asteroid impact cause widespread fires well beyond the impact zone? It’s conceivable they might have burned for years. That might not have changed the climate for thirty years but it might have sullied the measuring method. It all depends on what the impact hit. Ocean? No fires. 2 mile thick ice sheet? No fires. Forest? Fires. Desert? No fires. (There’s a fused glass plane in the Sahara from such an impact). Break up into multiple bolides over a couple of continents mostly ice covered or water? Small scattered fires like natural forest fires. Etc. Best evidence so far is for a modestly disbursed impact of several chunks but with the major chunks into the ice sheet of North Atlantic and only a few smaller bolides into ice free parts of North America or Europe (and many of them believed to be secondary ejecta – such as a set of “bays” in the Carolinas where their shape points back to a primary impact in south Canada). A fire can at most put more carbon into the layers. It can not add to the nano-diamonds that are also evident. It is all a rather fascinating rabbit hole to run down. My belief is that (looking at how all prior interglacials have ^ peaks and this one is more — flat topped) is that we were headed for a similar shoot up, reverse, shoot down over about 14,000 years; but the impact “clipped the peak”. It stopped the rise momentum of “whatever” was the process. Then we were already past that peak driver so just had more of a deflated “go flat” for 12,000 years. Now we’re on the normal downslope of a cooling post-inter-glacial BUT without the momentum downward from an overshoot peak. The impact damped the oscillation. The only good news out of it is an error band that says we might have another 1000 or 2000 years before it gets bad; and that we don’t have a cooling momentum underway just yet (perhaps all that farming, ploughing up dark earth, burning coal…) Still, from a geologic perspective, THE giant risk is that plunge. Then realize the Little Ice Age was pretty bad, there’s both a major 1470 year Bond Cycle and a minor half that 750 ish year half cycle, the L.I.A. started about 1300 (or 800 years after the catastrophic 536 collapse of the Roman Empire as conditions went to hell) and that’s about 700 years before now so…. Yes, I very much hope that is just “numerology”… but there’s a whole lot of cyclical history saying otherwise. Fall of Akkad. Pharaonic records of 100 years of droughts. Greek Golden Age and the fall of Greece. Roman Warm Period and then ice flows at Constantinople. There is a very strong climate cycle of long duration, with ‘ripple’ in it, that is being ignored by just about everyone at present. Look at the “flat line” of the Holocene in the graph above. Now stop ignoring the peaks and plunges of that “flat line”. Those are the ripple. What spikes up, then spikes down. Given that in the broad view (look at the outer envelope of the whole of 12,000 years) we’re rolled over into the cooling trajectory: IF right now we hit one of those down spikes as ought to happen given recent warming out of the L.I.A. the result will be far colder than the L.I.A. and far more damaging. We are on a “stair steps down” path at present, with the stairs increasingly steep. The next one down could be the one that starts the return of the glacial sheets. Again, the good news is that it is unlikely to be our problem. “Fast” for a glacial is still “glacially slow” and takes multiple lifetimes. Cold comes fast (as fast as 5 years) but the ice is a mass flow problem from evaporating oceans and that does not speed up with cold. 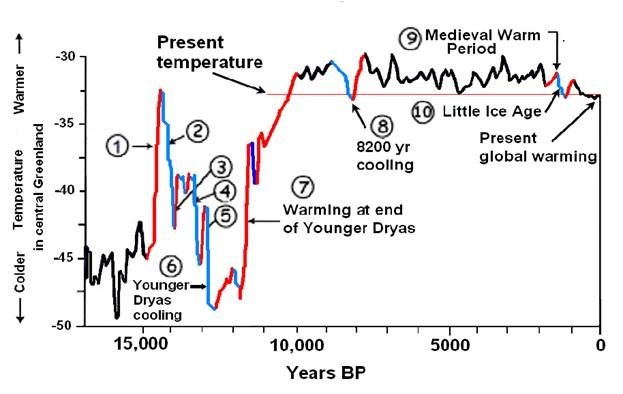 Yes but the sharp spike I am talking about happened 2000 years before the sharp cooling of the Younger Dryas and lasted about 500 years. How much heat do you have to put into the earth system to raise temps that rapidly. One thought that came to mind is, as shown in his video clip at one point much of the north atlantic was covered by sea ice at the end of the ice age. If thaw began and melt water began flowing into the ocean at some point that “lift” of a rising sea level would have unanchored that sea ice and perhaps resulted in massive calving of large block ice bergs. As they drifted south and melted they would have exposed a huge amount of relatively warm north Atlantic water to the atmosphere and that in turn would have dumped a huge amount of heat into the atmosphere relatively locally in the the gap between American and Europe. That could have set off a chain reaction of lots of ice into the tropics cooling those waters and caused over turning or some major disruption of the thermohaline circulation which could explain the descending spikes of heating and cooling as it headed back into the cooling of they younger dryas. Like a coffee pot near boiling, the heat release and cooling from a major reorganization of the sea ice in the north Atlantic would have caused some wild swings in air temps, as a new system of currents organized and stabilized in the north atlantic, and most of that impact would have been relatively local to the northern hemisphere. Like a PA system near feed back, it would have oscillated between a feed back state and a quiet state as the system sorted itself out into a stable circulation pattern. Florida has interesting things to say about Polar See-Saws. Heinrich, too. There are three things (among others…) that interweave in climate history. (Real climate history, not the “30 year average of weather” that some folks think is history. We’re talking 100,000 year scale here.) These are Heinrich Events, Dansgaard-Oeschger Events, and Bond Events ( Bond Cycles ). This paper ties together some of the Heinrich Event actions with some of the D.O. Events. http://www.ncdc.noaa.gov/paleo/abrupt/data3.html and it lists some of the theories as to why they happen. (Folks don’t really know). First off, notice that H. Events are much more rare. They are an ice rafted debris cycle, so you must have a lot of N. Hemisphere ice to do the rafting. Then it has to get broken up. So it’s possible that they are very special and rare, or that it just takes a bit more “oomph” in a faster cycle every so often to get one. Key takeaway for Heinrich events is that they show a wobble in temperature. A rise and a fall. Abrupt changes in climate, termed Dansgaard-Oeschger and Heinrich events, have punctuated the last glacial period (~100 – 10 kyr ago) but not the Holocene (the past 10 kyr). Here we use an intermediate-complexity climate model to investigate the stability of glacial climate, and we find that only one mode of Atlantic Ocean circulation is stable: a cold mode with deep water formation in the Atlantic Ocean south of Iceland. However, a `warm’ circulation mode similar to the present-day Atlantic Ocean is only marginally unstable, and temporary transitions to this warm mode can easily be triggered. This leads to abrupt warm events in the model which share many characteristics of the observed Dansgaard-Oeschger events. For a large freshwater input (such as a large release of icebergs), the model’s deep water formation is temporarily switched off, causing no strong cooling in Greenland but warming in Antarctica, as is observed for Heinrich events. Our stability analysis provides an explanation why glacial climate is much more variable than Holocene climate. Of particular interest is that “warming in Antarctica”. During a Heinrich Event, the Antarctic gets very warm while Greenland is getting cold. Called a “Polar See-Saw” or my favorite, a “Bi-Polar See-Saw”. (Somehow the idea of a ‘bipolar arctic’ climate has a nice ring to it ;-) So in the run-of the mill D.O. event, the arctic gets colder but sometimes “something special” happens and we get a Bipolar See-Saw with a cool Greenland and a warmer Antarctic. So that’s the general mechanism, but what happens when we hit a cold bump in our present configuration? Once the system is in the `warm’ mode with convection in latitudes north of Iceland, it becomes insensitive to the applied, weak 1,500-year forcing cycle (this experiment was performed but is not detailed here). The freshwater budget of the Nordic Seas is then dominated by the vigorous circulation; anomalies in surface forcing cannot accumulate to create noticeable salinity anomalies as in the stratified `cold’ mode. For this reason, the Holocene climate in our model is stable with respect to the 1,500-year forcing cycle, while the glacial climate is not. We can thus explain the large fluctuations of Greenland temperature during the glacial climate in terms of ocean circulation instability, requiring only a weak trigger but not necessarily any major ice-sheet instability. In the Holocene, the 1,500-year cycle is still present but is not amplified by ocean circulation instability, so that its signature is only weak. Oscillations of Pinus (pine) pollen in a 50,000-year sequence from Lake Tulane, Florida, indicate that there were major vegetation shifts during the last glacial cycle. Episodes of abundant Pinus populations indicate a climate that was more wet than intervening phases dominated by Quercus (oak) and Ambrosia-type (ragweed and marsh-elder). The Pinus episodes seem to be temporally correlated with the North Atlantic Heinrich events, which were massive, periodic advances of ice streams from the eastern margin of the Laurentide Ice Sheet. Possible links between the Tulane Pinus and Heinrich events include hemispheric cooling, the influences of Mississippi meltwater on sea-surface temperatures in the Gulf of Mexico, and the effects of North Atlantic thermohaline circulation on currents in the Gulf. The story has 2 links in it that specify particular articles, but on landing on the site, you just get the top page; so I can’t explore those articles at this time. The one that looks like it is for the stalagmite paper has the abstract quoted, so I’m going to paste that all here (once things start breaking, like links, I like to preserve what I reference if possible). I’ve added some white space and bolded some bits to make it more readable. Elevated Sr/Ca ratios and δ13C values in Holocene-age stalagmite BCC-002 from eastcentral North America record six centennial-scale droughts during the last five North Atlantic Ocean ice-rafted debris (IRD) episodes, previously ascribed to solar irradiance minima. Spectral and cross-spectral analyses of the multi-decadal resolution Sr/Ca and δ13C time series yield coherent ~200 and ~500 years periodicities. The former is consistent with the de Vries solar irradiance cycle. Cross-spectral analysis of the Sr/Ca and IRD time series yields coherent periodicities of 715- and 455-years, which are harmonics of the 1,450±500 year IRD periodicity. These coherencies corroborate strong visual correlations and provide convincing evidence for solar forcing of east-central North American droughts and strengthen the case for solar modulation of mid-continent climates. Moisture transport across North America may have lessened during droughts because of weakened north-south temperature and pressure gradients caused by cooling of the tropical Pacific and Atlantic Oceans. across the region throughout much of the year. As such, hydroclimates of eastern NA are dually sensitive to the climate state of the North AO and mid-latitude transcontinental teleconnections linking the Pacific and North Atlantic oceans [McCabe et al., 2004; Seager, 2007]. Herein, we demonstrate that this dual dependency allowed an east-central NA paleoclimate archive (speleothem) to directly record solar-forcing of Mid- to Late Holocene droughts that were caused by weakening of moisture transport over east-central NA in response to cooling of the Pacific and Atlantic Oceans. Again, the good news is that it is unlikely to be our problem. Oh, good. I was thinking up taking up the bassoon. It is a bit difficult to find info on Colorado for the little ice age period as it is often on the boundary of areas studied. But this chart shows Colorado river flow over the period and it looks like the Rockies are wet when Europe is cold. Several of the peak average river flows for the Colorado river fell in the 1300’s through the late 1600’s low flow was in the early 1900’s as the little ice age began to break down and climate returned to normal. As a counter point this study indicates that during the full blown ice age conditions eastern Colorado was in the dry cold outflow area off the ice sheets and had lower moisture. How ever without the ice sheet I suspect that transition band moves northward and climate here in the high eastern plains is not that much different than it is now. I will have to dig around to see what other info I can find. Big moisture in the eastern plains comes when the gulf moisture gets pumped up into Colorado in late summer, where winter storms bring heavy snows when a strong low pressure sets up in extreme south east Colorado and pulls moist air out of Texas into the foot hills east of the Rockies. Location of that low center and its strength makes a big difference where the moisture falls. A few tens of miles north and it dumps moisture in the Denver basin, a few tens of miles south and the flow gets cut off by the Palmer divide north of Colorado springs and the moisture falls in the Colorado springs and Pueblo areas. What I need is sediment records from long standing lakes on the Colorado eastern plains, annual river flows in the South Platte and Republican Rivers and Arkansas river in eastern Colorado. EM, Thanks for putting up this link to Bob Carter.I’ve been watching his 1 hr 22 minute talk over the past few days. I did not know of his work here in Oz against the Global warming scam. But it was so good to hear a plain speaking straight shooting Australian scientist saying how it was back then in 2011. Such a pity he is not here now to do some straight shooting & straight talking !